Just as a formality, I googled under “Captain Brian Beckmann” and “Nat Hentoff,” “Megan McArdle,” and “ACLU,” and even checked the ACLU’s national Web site, and under its Florida affiliate. Not one example of a civil libertarian individual or organization defending Brian Beckmann came up. Are there any other fake civil libertarians I should have checked under, like Ron and Rand Paul, et al.? I have heard of black public officials and uniformed service personnel making outrageously racist public statements, and never being punished for them, but have repeatedly heard of white men being punished and even cashiered for much less. The second most important lawsuit I can think of would be one challenging the constitutionality of all diversity training in public institutions as violating whites' First and Fourteenth Amendment rights, and their legal rights under the 1964 Civil Rights Act. The third most important lawsuit would challenge all diversity training in private institutions as violating whites' legal rights under the Civil Rights Act, which applies to the private as well as the public sphere. The most important lawsuit? That would challenge the legality of "Barack Obama's" 2008 candidacy and thus continuing occupation of the White House. 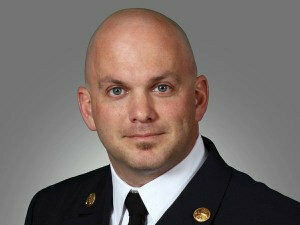 A Miami-Dade fire captain who blasted the handling of the Trayvon Martin case in a Facebook rant has been demoted. A Miami-Dade fire captain has been demoted down to firefighter as punishment for a rant, posted on his personal Facebook page, about the Trayvon Martin case, county officials said Monday. Capt. Brian Beckmann’s post lambasted the prosecutor, Angela Corey, who charged George Zimmerman with second-degree murder in Martin’s death. A screen shot of the Facebook page was sent to Miami-Dade Fire Rescue’s human resources department on April 12, according to county records released Monday. A day later, it was published on the website theGrio.com, an African-American news website. The ensuing investigation found that, though Beckmann’s Facebook page was personal, it hurt the public’s trust in the department, the disciplinary action report said. “While the opinion posted may have been personal, as a captain with Miami-Dade Fire Rescue, it greatly disrupted the public’s confidence in our entire organization as a result of the reference to ‘my co-workers,’ ” it said. Beckmann will be on administrative leave and must complete a psychological evaluation and diversity training before he returns, said Rowan Taylor, president of the Miami-Dade firefighters union. And when he does come back, it will be at the lower rank of firefighter. Taylor said an appeal already had been filed. The appeals process will likely take several months.